The golf history of St Andrews, set to the backdrop of the life of Old Tom Morris. Roger McStravick is a golf history writer, who has written for The British Golf Collectors’ Society, St Andrews Links Trust, Peter Alliss and is called upon as a golf history advisor for media and publications worldwide. He lives in St Andrews and is a collector of rare St Andrews books. “A natural successor to Colossus” – Peter E. Crabtree, co-author of Tom Morris of St Andrews, The Colossus of Golf, 1821-1908. “A masterpiece of research and presentation” – Dr Eve Soulsby, author of The Golfing Kyles. Lewine Mair (Daily Telegraph/Global Golf Post) called it “stunning”. What is 17 - 9 ? A great achievement for Author Roger McStravick. His commitment to this aspect of golf history in St Andrews is evident in this fine book. The History of old Scottish Golf is lost in the mists of time, however the modern Royal & Ancient Game of Golf has its roots clearly and openly recorded for those brave enough to search it out - Roger McStravick is one who has taken that extra step to enhance not just our knowledge but our full enjoyment of the game. In doing so he has proved the real quality of past legends and united a golfing dynasty that was in part only known to the odd member of the Morris Family. One day I hope to see a statue of Old Tom looking over The Old Course with the base plinth having the names of all The Open Winners - perhaps Rogers next project? Irrisistsble even to the non golfer. Lavishly illustrated and deeply researched book about the town of St. Andrews, including excellent information about the town and its important inhabitants. Fills what was a void, by delivering a serious, yet easily read historical account of the city and the people important to it. A must for any visitor or would-be-visitor to the Old Grey Toon. Excellent and very much needed history of St Andrews and all it means to the game of golf. Superbly presented and researched. Love Golf loved the book. Outstanding piece of work. Deserves every vote - and some. A real golfing classic. Do not miss this book! A really well crafted book. Beautiful to look at and an interesting read. Great work by a knowledgeable and passionate author. A must have read and book for everyone who loves golf and St Andrews. It has opened my eyes to an incredible story of St Andrews and a man I knew very little about. This book is going to be a classic for all time. Bringing St Andrews and Tom Morris to the masses is to be applauded. This book captures the spirit and history of St Andrews like no other book I have read. It also captures the characters of Tom Morris - old and young - and so many more and brings them 'alive'. It is a masterly book. A fantastic read. Full of very informative history and outstanding pictures. A must read for any lover of golf. A monumental piece of work celebrating the life of golf's founding father Old Tom Morris. Any book about Tkm Morris and St. Andrews is great! 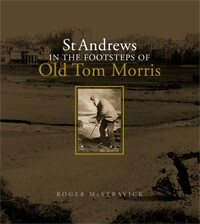 The definitive book on St Andrews at the time of Tom Morris. A wonderful achievement. An outstanding example of diligent research and excellent writing. Of interest to everyone but especially golfers. The first genuinely new book on the subject for a generation. Meticulous research, great writing, fantastic presentation and beautifully produced. Well written by an expert on the St Andrews life.